Born in New York City in 1950, Grace Gershuny’s early life took place far away from the agricultural epicenter of northern Vermont, where she thrives today. Her rural career began after her time at Queens College of the City University of New York ended. It was here that she earned a B.A. in Mass Communications. By 1973, Gershuny was a Vermonter and market gardener alongside her husband at the time, Stewart Hoyt, who supplied artistic talent for Gershuny’s earliest editions of her book The Soul of Soil. Within two years Gershuny was constructing the Northeast Kingdom Farmers Market as a member of NOFA (Natural Organic Farmers Association). She moved through NOFA’s ranks in 1977, earning the title of Certification Coordinator, leading her to the position of Vermont State Coordinator in 1979. Gershuny sought to continue her education at the age of thirty, this time at the University of Vermont from which she received a Master’s degree in Extension Education in 1982. Just one year later, she published the first edition of The Soul of Soil, followed by a second edition in 1986. Both editions received high praise and even garnered international attention because of the work’s appeal to farmers from all backgrounds. Gershuny’s next book, Start with the Soil, was published in 1993. 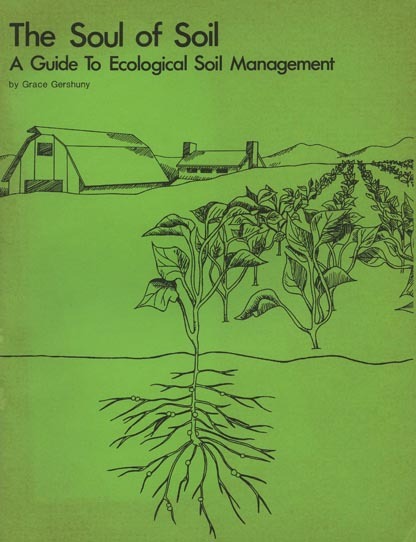 The Soul of Soil is now in its fourth edition as of 1999. Grace Gershuny is currently living in Saint Johnsbury, Vermont, and serves as an active faculty member at the Institute for Social Ecology, as well as a blogger for Chelsea Green Publishing and a board member of the Highfields Center for Composting. Gershuny’s papers contain numerous drafts, reviews, and publicity of both the first and second editions of The Soul of Soil, as well as a large number of magazines and articles submitted for review during her time as the editor of Organic Farmer magazine and chief of Gaia Services. Other materials relate to her work for the Northeast Organic & Sustainable Farmers Network (NOSFaN) including reports and publications on organic and sustainable farming that were collected during the mid-1970s to the early 1990s. Among these are publications by Appropriate Technology Transfer for Rural Areas (ATTRA), issues of Organic Farmer, and other alternative farming magazines. Audio tapes dating from 1991 to 1993 discuss soil science, sustainable agriculture, the definition of organic quality, and modern changes to the meat industry. Gershuny’s personal writings detail her definition of organic agriculture as well as her efforts to support sustainability in the Northeast. Materials gathered from her time as a coordinator for the Vermont division of NOFA include calendars, development plans, and interactions with other small organizations based around aiding farmers. Finally, the collection contains information on courses held at the Institute for Social Ecology, copies of required texts, and course requirements. Kiplinger Agriculture Letter, Rutland Daily Herald, Homeopathy Today, The Rural Education Center (TREC) Quarterly. OFPANA, NOFA, FLO, CCOF, Little Bear Trading Company, Farm Verified Organic, organic farming informational pamphlets; NY Times clippings; Soil Fertility Guide. Toronto’s Food Charter/Policy Council, Sustainable Agriculture and Rural Development (SARD). New York Times, Boston Globe, misc. Includes World Sustainable Agricultue Association, Consep, & NOSFaN. NOFA, NOSFaN, OFPANA, LISA, & others journals/publications on sustainable agriculture, alternative farming, livestock care, chemical usage. Acquired from Grace Gershuny, 2011. Processed by Haley Chauvin, December 2013. Cite as: Grace Gershuny Papers (MS 793). Special Collections and University Archives, University of Massachusetts Amherst Libraries.